Happy Monday friends! It’s been a while since we had cupcakes, let alone cupcake Mondays. 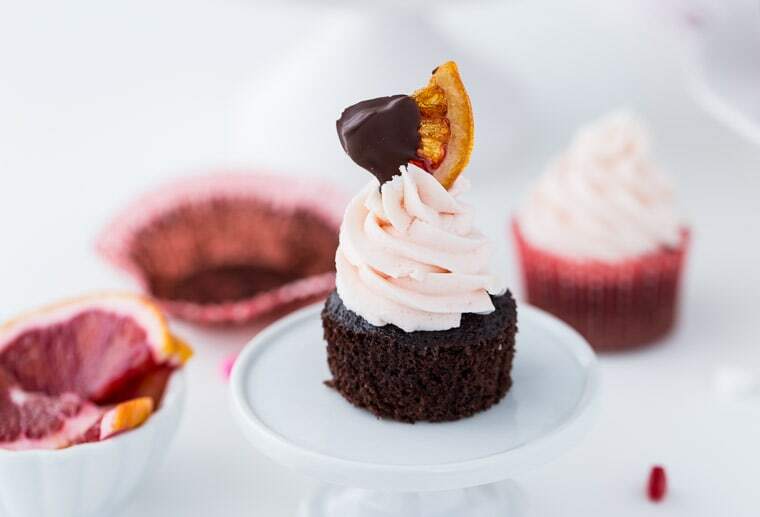 So popping in today with a fresh, delicious cupcake in the form of these Blood Orange Chocolate Cupcakes. 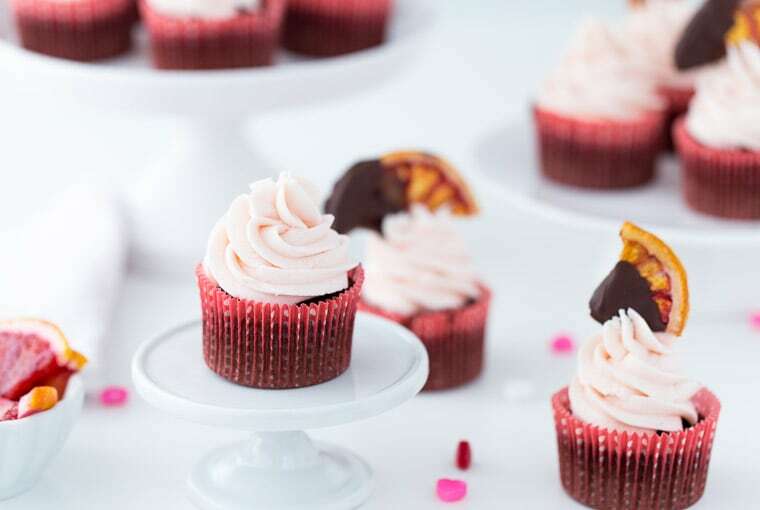 With Valentine’s Day just around the corner, these cupcakes are coming to you just in time to make them for that special someone which includes yourself. But before we get to the cupcakes, two words: Winter Citrus!! Blood oranges, grapefruits and oh my, meyer lemons. These are some of the reasons we survive cold winter nights. Sadly, I’ve yet to indulge in any besides blood oranges. But there’s grapefruit and Meyer lemons in the cue and I can’t wait to share those recipes with you. Just to recap our blood orange escapades the past few weeks; there was this blood orange moscow mule (refreshing and brightens your day! 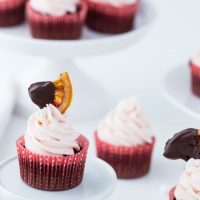 ), this wonderful blood orange mimosa cake (with a giveaway still going on BTW) and now these blood orange chocolate cupcakes. There’s something just wonderful about the bold, sweet flavors of blood oranges. 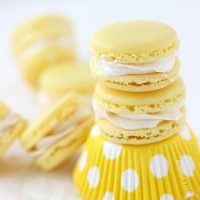 Make sure you grab some before they are out of season and make some baked goods! These cupcakes use my favorite chocolate cupcake recipe as a base and it’s boasting with sweet orange zest and dark chocolate made richer with a hint of coffee. 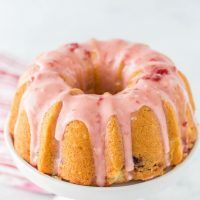 Topped with a blood orange frosting (isn’t the color gorgeous?? ), they are finished with decorative edible candied blood oranges dipped in chocolate. The little extra touch to make these e perfect for Valentine’s Day. Sift together all the dry ingredients in the bowl of an electric mixer. Add the zest. 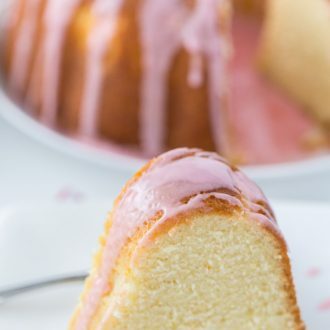 In a medium bowl, combine all the wet ingredients using a whisk. Add the instant coffee into the wet ingredients. Mix the dry ingredients on low speed for 1 minute. Stop the mixer and add half of the wet ingredients. Mix for a minute on medium speed and scrape the sides and bottom of bowl. Add the rest of the wet ingredients and mix for additional minute on medium speed. The batter will be thin. Divide evenly among the cupcake liners. Whip butter for 8 minutes on medium speed using the paddle attachment of an electric mixer. The butter will become pale and creamy. 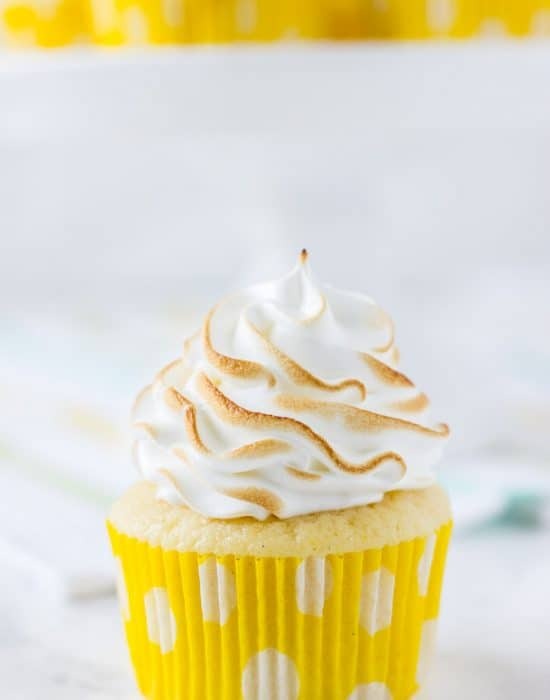 Frost cooled cupcakes using your favorite decorating tip. I used Wilton Tip 1M for these cupcakes. Top with candied blood orange slices. Oh I love citrus and chocolate together! I LOVE these Zainab! Just when I thought your blood orange game could not be topped, you bring us these beauties! Thank you! 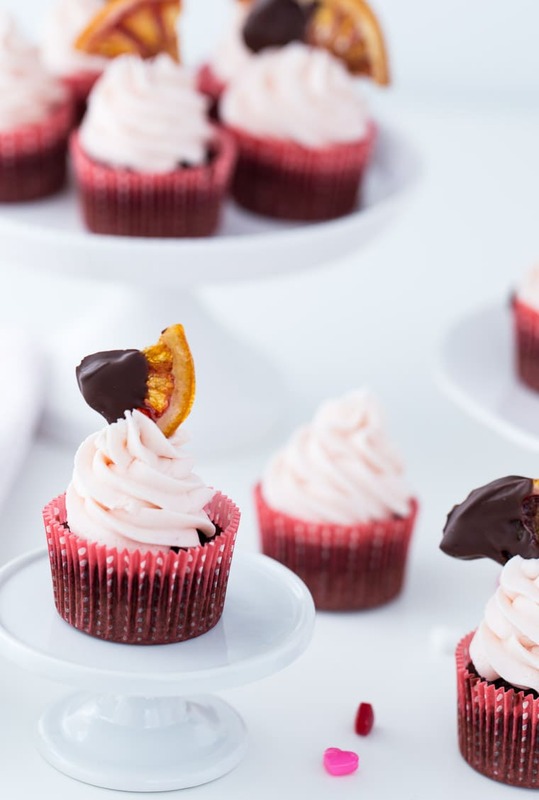 You’re seriously killing it with the blood oranges lately, and these cupcakes are the prettiest things ever! 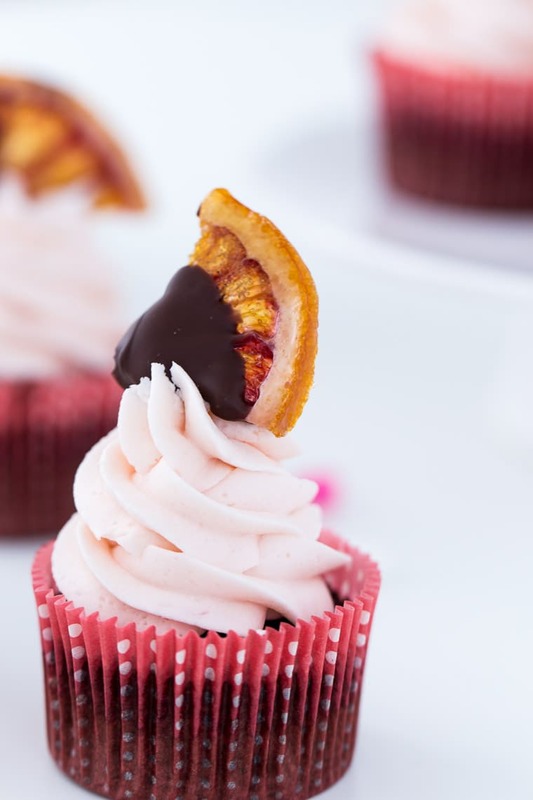 I love that you paired blood orange with chocolate — I haven’t tried that yet so I need to make that change very soon with these cupcakes! Oranges and chocolate are a great combo! They came together well here. Thanks Marcie! Yes I agree! That adds a bit of citrus flavor in there. I adore winter citrus! I have blood orange in my kitchen waiting to be used. 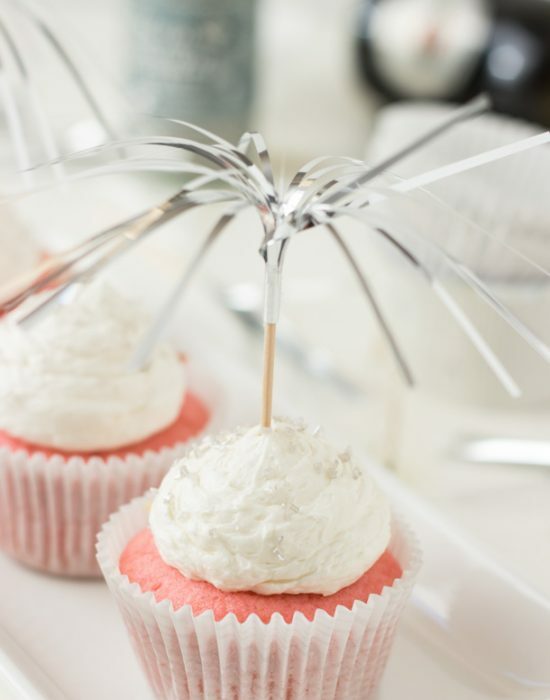 These cupcakes look so gorgeous – I love that frosting! 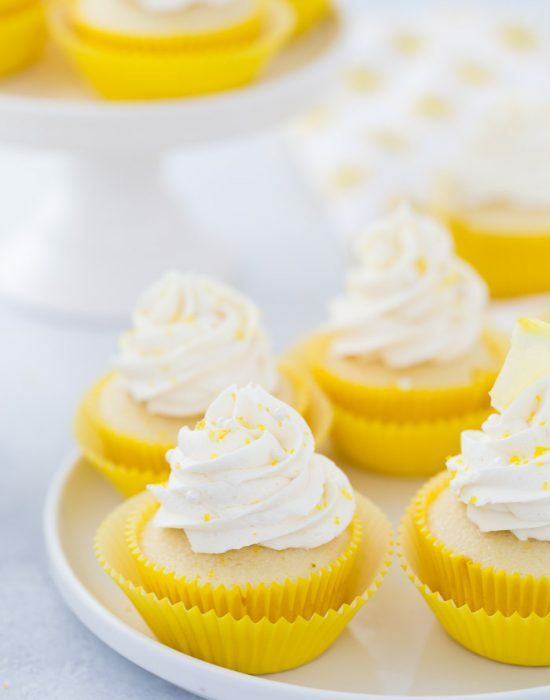 Hooray for winter citrus season and cupcakes! 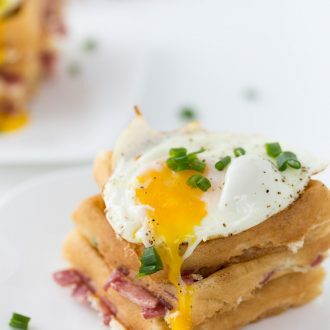 These treats look dreamy. Yes grab some blood oranges. I’ve made candied blood oranges before and they were insanely addictive! These cupcakes are gorg! They are so addictive! Thanks Jessica! Beautiful cupcakes! I love the way coffee adds flavor to chocolate, and the addition of the blood oranges is so smart. Perfect for Valentine’s Day. 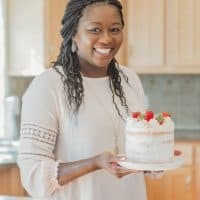 Yes, that’s one of my favorite tricks to chocolate cake! These cupcakes are just too pretty! 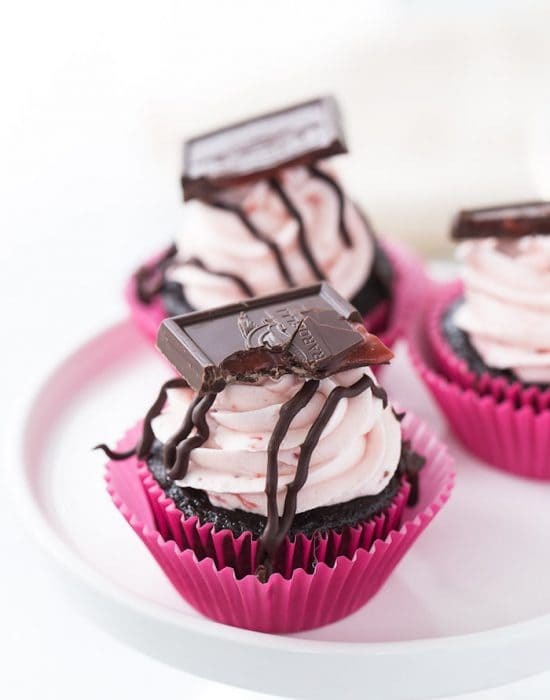 And chocolate + blood orange sounds amazing….have to try it! I have some blood oranges left over from a recent recipe I tested. I know just how to put them to good use! 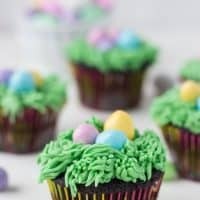 These cupcakes are lovely! Blood oranges are my Mum’s favourite! And I know she loves chocolate (like any reasonably human does!) so these cupcakes are sure to be a winner next time I bake her up a treat 🙂 I love the gorgeous candied citrus dipped in chocolate too. So pretty! Wouldn’t the world be SO much of a better place if all Mondays were cupcake Mondays?! I vote yes. 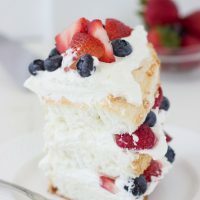 I wish I were kicking off my tomorrow with these! I agree! Would be so much better 🙂 Hope you are doing great dear. Last year I kept finding these blood oranges from Italy. They were amazing, but isn’t everything from Italy. 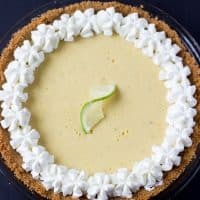 These cupcakesites are beautiful! Happy Valentine’s day, Zainab!